To say the Caney is crowded these days would be an understatement. Apparently everyone has heard about how great a river it is and has to get in on the action. Unfortunately for all those hopeful for a day of spectacular fishing, the river continues to be a bit tough for wade fisherman. I only saw a handful of fish caught today by fly fisherman but the bait guys seemed to be doing okay. My general fishing methods employ the use of 5x or 6x tippet (normally fluorocarbon) when fishing on tailwaters. The last couple of trips, Friday and today, have forced me to downsize. Today, all but one fish came on whatever fly was tied to the 7x tippet in a three fly rig. The first fly was on 5x, the next fly was dropped with 6x, and the last was on 7x. Over the course of the day I had to retie multiple times because I kept breaking off on the light tippet. Several things really stood out to me today. Probably each will be worthy of its own separate post as I have time to mull everything over but for now I'll just mention them. First, it doesn't matter how great a river is, it can only handle so much pressure. Just before leaving for the day, I watched a couple of bait fisherman haul in one nice fish after another and put them on their stringers. When I say nice, I'm not talking about 12-14 inch fish but nice 15-18 inch fish. 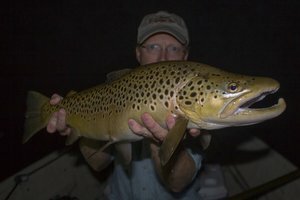 I realize that everyone is entitled to use their fishing license as they see fit, but watching that many quality fish leave the river is difficult knowing that given another 6 months, they would probably all be solid 18-20 inch fish. If the fish just had the opportunity to grow the river would be full of large fish. The second thing that stood out to me today was that there is absolutely no boater etiquette being observed on this river except by a very small minority. I watched many boats float down the river without regard for the numerous wade fisherman. In fact, I saw a few wade fisherman literally dodging boats that refused to move. I saw probably 3 boats in which the occupants were polite including a well-known guide that went out of his way to maneuver clear of as many wading fisherman as possible. If you have any idea of how crowded the Caney is, you know just how many other boats were not very polite. Finally, it seems that the fish are not spread out quite as much right now. 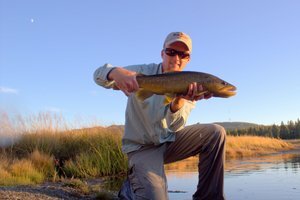 Once you start finding fish it can be easy but it can take as much good observation skills as actual fishing skills to find the fish and figure out how to catch them. Mudboots, funniest thing is that it really isn't what I would call prime water. Decent yes, but most people are too lazy to explore for themselves and find better water... I've seen pictures of Pyramid Lake and it looks crazy but I'll have to try it someday. Do you fish it much? Nice blog. It is funny about the crowds it was not very long ago that even on the weekends you could be by yourself. 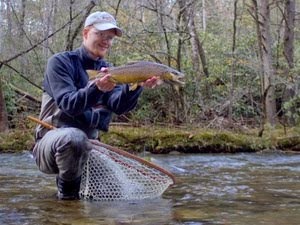 Do you post on trophyfishingtn.com? If you do I am hidden_hatch on there. 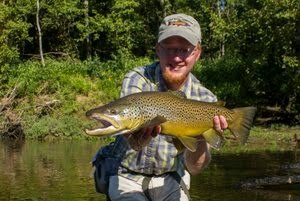 I fished the lower river on Friday with a friend. There were boats all over the place for that area. Keep up the good work. Hello I'm fernando, The Spanish. I have never seen a thing like that in our rivers. When I fish near my town it is difficult to see more than 2 anglers near the place you fish.Great job, and I am particularly amazed with the size of the hooks you use. Kindoff reminds me of the Davidson River crowds in late summer and throughout the fall. With temperatures in the upper 60's to low 70's in the middle of winter it's tough to find a secluded spot. hey david, i couldent agree with you more. 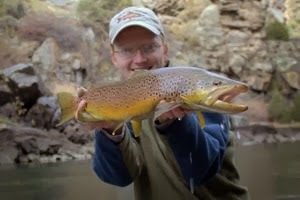 when i fish these small trout stream gems in az and see people leaving with the larger breaders it hurts. but they are more than legal to. another point you made, crowds. for me one of the biggest reasons i love fishing, is getting away, relaxing and enjoying gods creations at its best. i hike the extra mile or drive the exrta hour just to get away, im sure many other anglers do to! sorry so long , but keep up the good work i really enjoy your postings! Fernando, it must be nice to have the streams to yourself mostly. I wish I could fish and only see 2 other anglers.